Some eleven years ago now, an Alaskan Malamute puppy tugged at our hearts the first time we ever laid eyes on him, a fluffy ball of fur so small that he fit comfortably into a shoebox. From that time on, we’ve been his. Technically though, Gannon wasn’t ours; he belonged to our son and daughter-in-law. But we often joked that Grammy and Grampa had “joint custody” because we walked him three times a week and looked after him when his owners had to work long hours or went away on vacation. Our house became his second home. 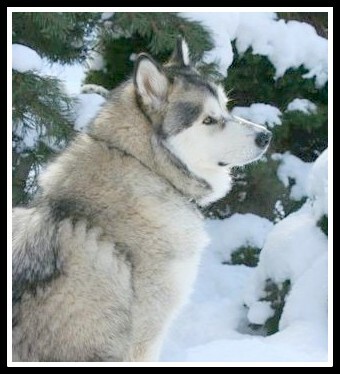 Malamutes, as any owner will tell you, are strong, highly intelligent, independent and fairly pig-headed animals. They will obey an order if they feel like it, or if there’s food involved. They are also loving and friendly—some would say indiscriminately friendly. Malamutes generally adore people, so don’t ever get a Malamute as a guard dog. As the books say, “They’ll wag their tails, welcome the intruder into the house, and show him where the silver is kept.” They mostly don’t bark, although they can if they need to. Gannon was a big dog. I could pat him without even bending over, and I loved to play with his soft, silky ears. 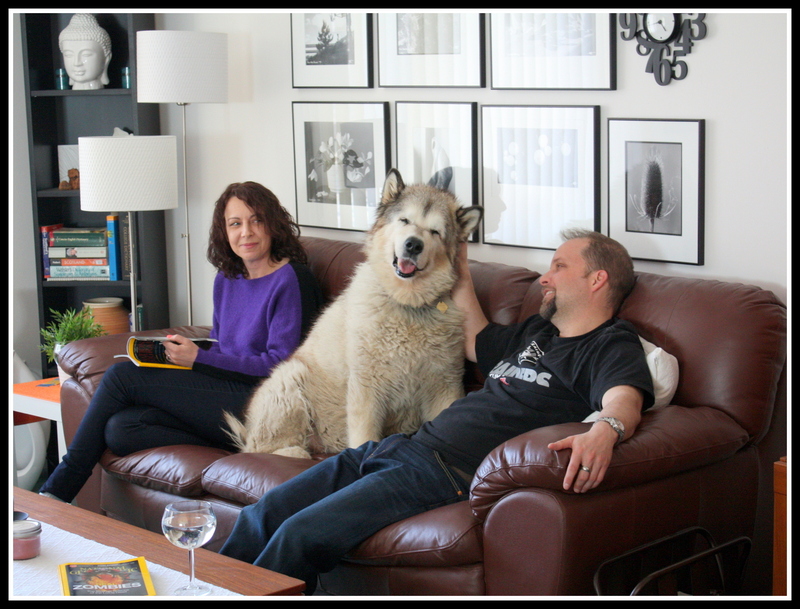 Like most Malamutes, he was quite the conversationalist. If he felt that a conversation needed to include him, he would start up with his trademark Malamute “woo woo” to let us know that he was here too, thank you very much. Gannon wasn’t much crazy about other dogs, but he loved humans, all of whom were his friends. He especially loved his four-person pack. As he grew into old age, he liked to have at least some of his peeps close by, and he would often round the two of us up if we were in opposite ends of the house, so that we were together, the way he liked it. Today our beloved four-footed friend took his last breath in the loving arms of his two pack leaders, with us, the two other members of his pack, standing close by to see him off. Godspeed, Bubby. You were much loved. Safe home. My deepest condolences. I know how hard it is to lose someone that most won’t call family. I grieve with you and hope you can overcome your sorrow. Thank you, Barbie. No matter how clearly you can see it coming, I don’t think anything can prepare you for the actual loss. But we console ourselves that he had a really good, long life, and he was surely one of the best-loved animals in the world. He’s wonderful. I’m sure he’s up there with all my snow dogs running in the drifts that are never crusty or hard and having the time of his eternal life. He’s in good company, but I know you will all miss him very, very much. I’m happy you could be with him at the end with all the other members of his pack. I know it meant everything to him, too. Thank you Martha. He was a wonderful dog, and it pleases me to think of him running in the drifts. As the song says, “Mon pays, c’est l’hiver.” Winter was his natural country, and he loved to sleep in snowdrifts. Thank you, Martha. That’s one of my favourite photos as well. You said it perfectly: not really pet and master. No, Malamutes carve a different sort of space for themselves in the heart. Part of what I loved was exactly that wildness, that independence. Gannon loved being loved, but he retained a dignity that spoke of choosing us as much as we chose him. Thank you. He was special to us, that’s for sure! My thoughts are with you. Love the photo! Thank you, Nancy. Gannon was a photogenic fellow!